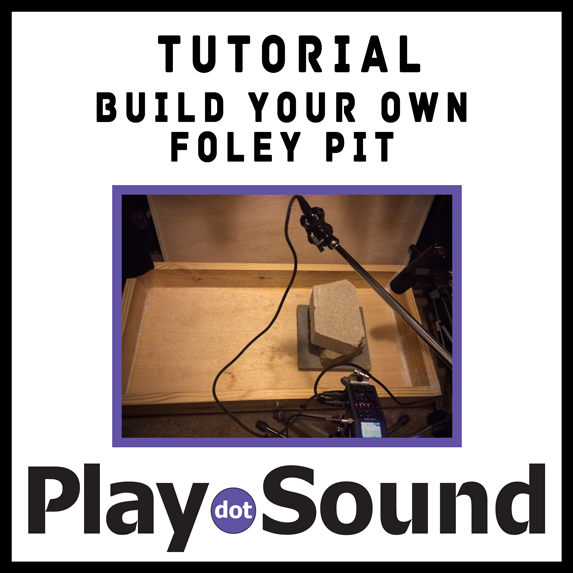 How would you like to build your VERY OWN FOLEY PIT? You are in luck! 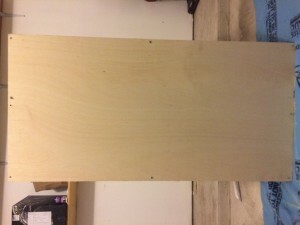 This post will give you photos, plans, and a detailed receipt of everything you’ll need to make your own DIY Wooden Foley Box for your home studio or facility. 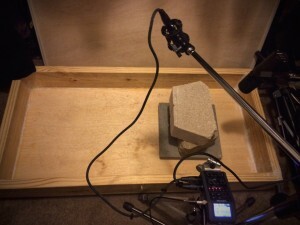 First, let’s briefly chat about Foley for anyone new to the process. Feel free to skip ahead to the build section below. Foley is the art of creating sound to picture. Pretty much every video game that’s made your thumbs numb and every film that’s led you into another world has foley to perfect the audio experience. 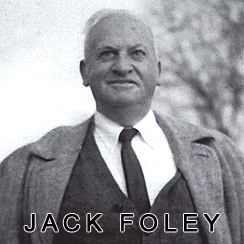 JACK Foley was the man credited with founding the foley process on films back in the 30’s for Universal Pictures. Since then, the art has been expanded into a widespread art of foley for movies and video game audio! Many larger projects use big facilities with fully built out foley pits and hundreds of items on hand to make whatever sonic palette is needed for each project. 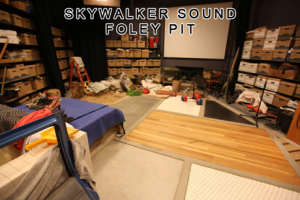 One such facility is the Foley pit at Skywalker Sound, which does absolutely OUTSTANDING work! 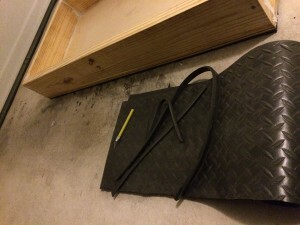 So, how can YOU make your own Foley pit and join the ranks of such notable professionals? Well, a full build out is both cost and space prohibitive. If you are thinking of going down this road I am pretty sure you aren’t here reading about how to do so. Please hire a professional! 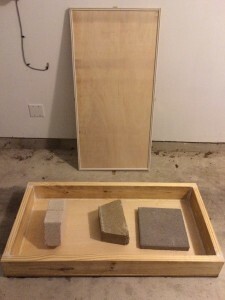 However, if you are like me, and want to do Foley in your own home studio or small facility, then I’m going to share how I built my very own Foley pit (Foley Box) for just over $100. 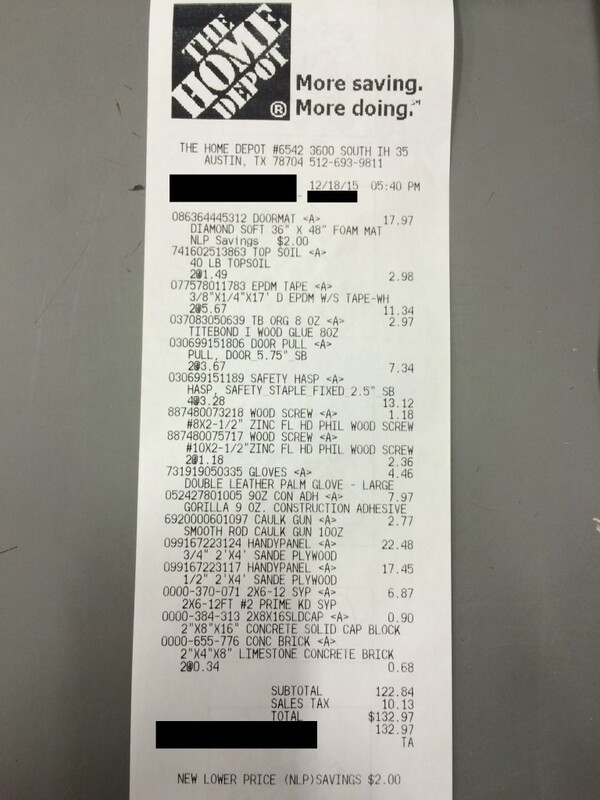 Here you can view the receipt for all the materials. Not everything is essential, but I wanted to go all out with latches on the lid, weather stripping to prevent things from leaking out when stored on it’s side, handles for moving it around, a rubberized plastic mat to glue to the bottom, lots of adhesive to dampen resonance and secure the edges, and nice thick wood that will not break when dropping heavy concrete bricks. Note that you will also need a power drill. 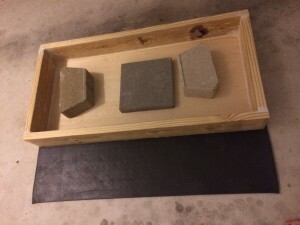 The stone isn’t necessary either, but I used it for a current project. 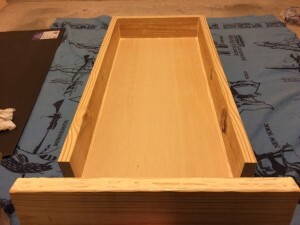 It also worked well to keep weight on the Foley Box while the adhesive was drying! 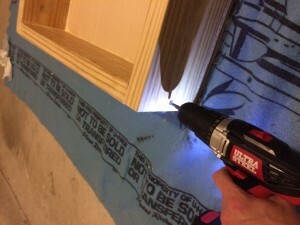 You only need one 2X6 – 12′ board for the edges as long as you follow this plan. 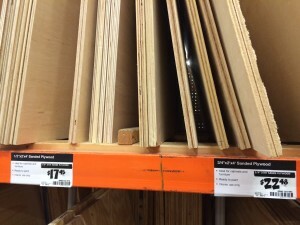 I bought one 1/2″X2’X4′ plywood for the lid and one 3/4″X2’X4′ for the bottom. I felt this was a good compromise on cost and weight. 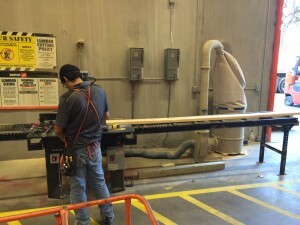 The MDF didn’t feel sturdy enough to jump on and I didn’t want to waste money doing it wrong. 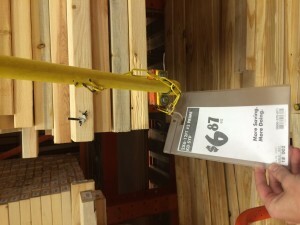 I imagine you can find cheaper wood, but this worked for me. It’s taking shape! There will be crevices on the seams. 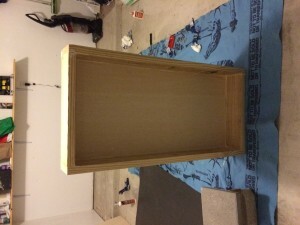 This can be filled with some Gorilla Glue caulk and Wood Glue later on. I wouldn’t stress about them being PERFECT, but find the best pieces of wood you can. I I meant to buy 3 packs of #10X2.5″, but accidentally bought one #8. I recommend the #10 which fit better and are sturdier. Double check. 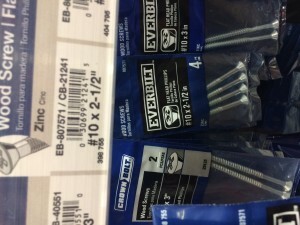 The packs of screws get all mixed up in Home Depot. 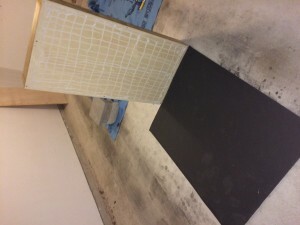 The Gorilla Glue, and a caulk gun, are for sealing the seams and gluing the rubber/plastic sound mat to the bottom. Any wood glue will help keep the pieces together. The screws and wood glue will keep it very secure! 2X weather stripping for the lid. I wanted to put it out of the way in a closer on it’s side and needed a seal around the edge to accomplish this. 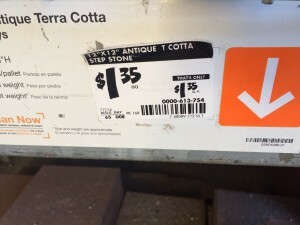 I also bought 4 latches and 2 handles to lift it and move it easily. Still with me? GOOD! It’s time for you to assemble all the pieces! This process takes about 5 hours and needs to dry overnight. First, take the edges and put them on top of the bottom piece. 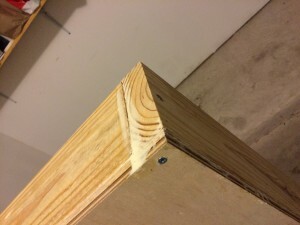 Make sure you put the best looking sides on the outside and get it as tightly fit as possible. Shuffling around the pieces may change how it all sits together, so find the best fit before gluing it down. Then, take the wood glue and slather it on. I went heavy with it to attempt to reduce resonance between pieces. Then, as it’s drying, take your wood screws and screw it together. I did the order of side edge to the front and back, bottom of the side edges, middle of all edges. 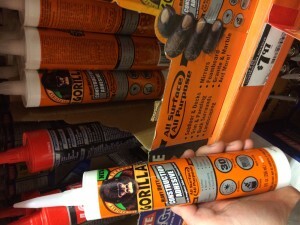 Lay the mat down and get the Gorilla Glue adhesive ready! I did a full patten to ensure it sticks well. 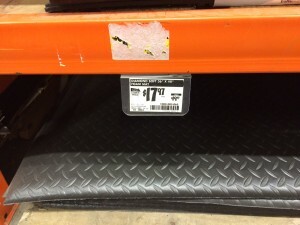 I’m not sure this is the best glue for rubber, but it was the best option at Home Depot. This seems a bit loose on the adhesive and takes much longer to dry than the wood glue. 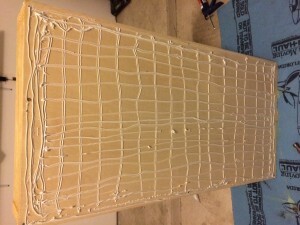 In retrospect, I would try a different glue for the bottom panel! It isn’t sticking as well as I thought. It holds, and it is heavy enough to weight it down anyway, but try a better adhesive for this! FWIW, the gorilla glue DID seal the seams very well! 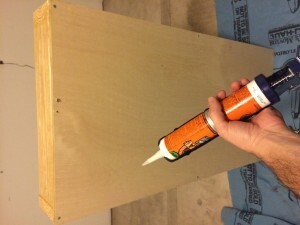 Now pick up the 1/2″ lid, cut the weather stripping, and tape it down across the edge. 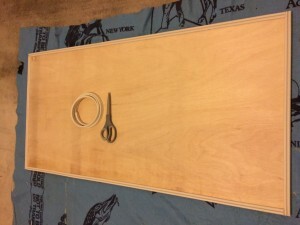 Attach the latches to the top of the lid at the mid point of each side. After securing the top of it, add the latch mechanism. Be sure to put a BIT of pressure on it and mark where the latches go! It must be secure, but if you make it too tight you will never be able to shut it. So, press with a firm, but not overdown pressure, and make sure it hits that sweet spot. 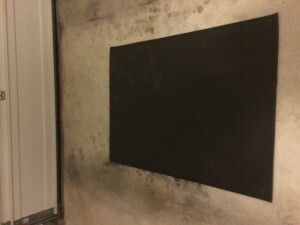 I used an exacto knife to cut the mat around the edge. That’s it! Let things dry as you go. 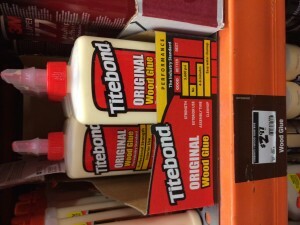 The wood glue takes 30 minutes to be secure and 24 hours for full bonding. The Gorilla Glue takes 24 hours. You can optionally sand it down afterwards for a cleaner look or put a lacquer on the wood to make it last longer. Honestly, I don’t mind the raw look of it and don’t want to take the time. After all, I will probably be beating this thing up and getting it super dirty anyway. Congratulations! If you made it this far you have your very own Foley Pit to make sounds to picture! It even has a handle and has a sealed lid to prevent leakage if you need to lift it out of the way. Well, I JUST made this last night, but the initial tests were very promising! The extra adhesive and glue seems to have dampened the wood tone quite a bit, the 2X4 length seems to spread out the boxy tone and the short height also prevents sound waves from bouncing around as much. The adhesive didn’t work very well on the bottom plastic/rubber mat, so if you build these definitely consider alternative adhesive. The bottom stays on quite well, but only due to the pressure from the wood. I’ll update this page as I put it through it’s paces! 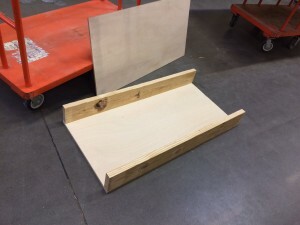 If you enjoyed this post, you will probably love my previous tutorial on building your own professional acoustic panels for only $30 a piece! They compare to professional quality room treatment and are very simple to build. Thanks for visiting PlayDotSound! Your best resource for learning about video game sound! Come back soon for more posts about game audio, sound design, composition, integration using engines like Unreal and Unity, and much more. Play Dot Sound is created by multiple award winning sound designers and composers in the video game audio industry. Our purpose is to educate, connect and inspire both beginners and professionals to make better sounds for their games. Very nice Aaron, I’m currently in the process of doing some DIY projects. 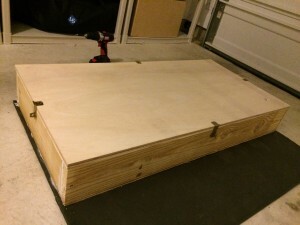 90% complete with some panels and was mapping out ideas for a foley pit. For years I’ve used movers blankets as a dampener when smashing fruits and veggies or walking on different textures (other than wood). But a pit is definitely needed. Great build, thanks for the tips. One thing I would suggest is flipping your images right side up, makes them a bit easier to view. 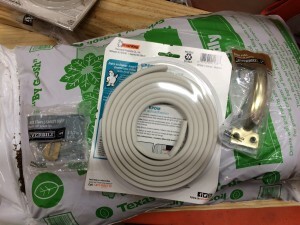 Looking for to seeing more of your diy projects. How did recording some samples go is there a place to audition them, was there also any low end or boxey issues? Play Dot Sound is a website dedicated to help you make the best game audio possible. Play Dot Sound is the creation of game industry veterans Aaron Brown, Brad Fotsch, and Matt Piersall. This site is full of insider tips on creating video game sound effects, how to make music for video games, and how to integrate it all into your games. There will also be interviews and articles from video game industry leaders to help inspire both audio professionals and newbies.